This is a collection of this great Manchester based band that re-incarnated recently.It contains almost all their works from 1979 to 1990. It began when Martin Bramah teamed up with Una Baines to form the group’s creative nucleus. Bramah’s voice whether wailing, shouting, calling or just talking is always looking for a different angle, another way of being. Una’s inspired, strung-out keyboard playing, flowing and soaring, weaving around Martin’s inventive, discordant guitar patterns. The overall effect created a madcap cathedral of sound. Paul Morley, when reviewing their second single "Work" said, "They rave but they are not mad." The name of the band came from John Cooper Clarke, Manchester’s "Punk Poet", who envisioned the Blessed Orchids as a bunch of haemophiliacs raised by alsaition dogs on a council tip, the weediest gang in Salford! Somehow, the Blessed became the Blue and these rare and fragile blooms were born. Interest from Geoff Travis of Rough Trade records secured them a record deal in the summer of 1980, and the release of their first single, double A side, "The Flood/Disney Boys" co-produced by Mayo Thompson of Pere Ubu fame. This primitive but sparkling wall of sound was quite unlike anything else released at the time and drew comparisons with the 1960’s pychalelic movement. Phil Spectre meets the Velvet Underground at Blackpool illuminations… sort of. Next they released what is widely regarded as their definitive sound, the hauntingly beautiful "Work" flip side "The House That Faded Out". An intense miner key maelstrom, Work is a cracked soul music. Bramah is here more concerned with the plight of his immortal soul than he is of getting a job. Coincidentally, the Blue Orchids "Work" was released the same week as Bow-Wow Wow’s "W.O.R.K." and Spandau Ballet’s "Work ’Till your Muscle Bound". The spring of ’81 saw the band enter an eight-track studio in Manchester and two weeks later they emerged with the master tapes of "The Greatest Hit" their first album. Dave Hill writing in City Limits dubbed it "post-punk neurodelia", while the N.M.E.’s Mat Snow admitted they were late to the party when he wrote, "The Blue Orchids’ debut LP has been riding high in the independent chart for weeks now. But it’s not belated amend-making when I say it’s one of the best albums we’re likely to hear all year." These recordings really showcase Una’s keyboard playing; she used the same simple Yamaha organ, with just three tones, throughout. Stand out tracks are "Sun Connection", "Low Profile" and "Bad Education" with Bramah’s lead guitar howling though numbers like, "No Looking Back" and "Dumb Magician". It was at about this time that the band was introduced to the legendary Nico, one of Andy Warhol’s brightest stars. The Blue Orchids became her backing band and support act on a subsequent tour of the UK and Europe. These were heady days for the young Mancunians, whose minimal musical style was the perfect match for Nico’s dark introspective soundscapes. This intriguing collaboration never made it on to record but there are apparently bootlegs of live shows in circulation. After this creatively rewarding episode in the band’s career, Martin felt it was important to get a fresh sense of the group’s aims and direction. New material was written and at the beginning of ’82 they were back in the studio to record the "Agents of Change" EP. This session showed a new maturity and confidence in production of their own songs. The subtle influence of Nico’s music can be heard in tracks like, "Conscience", "Release" and "The Long Night Out". While the title track is pure, driving, Blue Orchids at their best. "Agents of Change" was the last recording the band made for Rough Trade and by the end of the year they had decided to disband, for what turned out to be about two years. At the end of this period of musical limbo, in the winter of ’84, Bramah and Baines put together a brand new line up of Blue Orchids and began playing live again. This was followed, in the spring of ’85, by the release of two tunes on a 12-inch single, "Sleepy Town" and "Thirst" on Racket Records. There is a dry humour present in the lyrics on these tracks and more than a hint of the indie/dance crossover that was soon to become the Madchester phenomena. However, after playing a few dates in Austria and Germany, Martin and Una parted company to pursue separate interests. Una formed a band called The Fates, who released the album "Furia" on Taboo Records, whilst Martin Bramah put together Thirst with ex-Fall drummer, Karl Burns. Thirst made one EP for Rough Trade, called "Riding The Times", a truly rare gem. Martin and old partner Mark E. Smith were reunited in 1989 when he re-joined the Fall, producing the epic "Extricate", for many the quintessential Fall album, plus, the outstanding "White Lightening" EP. After embarking on a world tour to promote this work, Bramah returned to the UK and gathered up another bunch of Blue Orchids. The result was the 12-inch single, "Diamond Age" and "Moth" released on As Is records in the autumn ’91. Diamond Age is a cascading waterfall of sound, featuring a spoken dream sequence in the middle of this almost transcendental pop song. The last recording the Blue Orchids made was the concept EP "Secret City". Featuring "NY Gargoyles" the sound track to an imagined movie, "Love Fiend" and "Out of Sight" an intimate ballad, subtly observed and possibly Bramah’s best-realised arrangement. Wow, blast from the past! 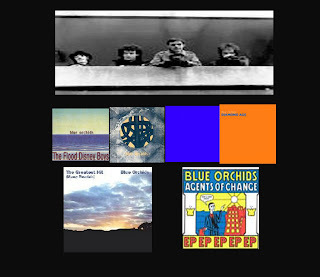 I saw Blue Orchids several times during early-mid eighties..I lived in n/w england & saw many gigs in manchester during this period. Most of the tracks here are also (in hi-fi form) on Cherry Red's "A Darker Bloom" comp - www.cherryred.co.uk/cherryred/artists/blueorchids.php - there's been a flood of other stuff in the past few years, listed at the band's site. The only thing we're missing is gigs! I love this band. Any chance you have the lp FURIA by Una Baines' band THE FATES, released on Baines' own label. I need to hear it!